You are here: Home » Wisdom Who Can Find? 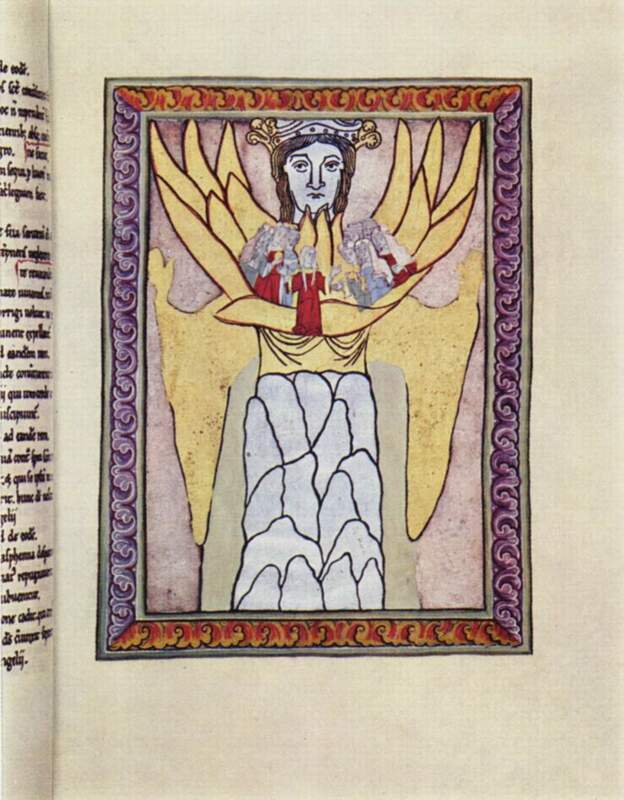 Hildegard of Bingen’s art depicting the Church and Holy Wisdom (Ecclesia and Sophia). Often referred to as a guidepost or handbook for living and this in most part is true but there are parts of the Bible that seem callous and cruel and do not provide to us a guide to healthy and positive living. Therefore, before using the Scriptures as a guide to living, the reader should be discriminate and have an understanding what the story of the Bible is. While the Judaic and Christian Scriptures are a set of books as in a library sometimes separated by centuries, one can follow a story line. I think this is true particularly in the Christian canon and organization of the Old Testament. Not too many Christians are aware, however, that the Hebrew Scriptures comprising Christianity’s Old Testament are organizationally different. For example, in the Jewish canon, the books we think of as Wisdom Literature appear in the last of three sections called “The Writings.” In this section, we find the Books of Psalms and Proverbs. Additionally, Job, Ruth, the Book of Daniel and others comprise the Writings. This is the last section of the Jewish canon that ends with the Books of First and Second Chronicles, which leads to other thoughts when you think of the last book in the Christian canon, is the Book of Malachi. That too is another topic for another time. I want to focus on the Wisdom Literature of both the Hebrew Bible and the New Testament. The Christian texts comprising the New Testament, while not divided into sections as in the Hebrew Bible, when sorted into sections looks like this: the Gospels, the Acts of the Apostles, the writings of Paul, the Catholic Letters, and the Book of Revelation. However, this is not the chronological order. I wonder how we would read the New Testament if the books were in chronological order? Paul’s First Letter to the Thessalonians would be the first document we would encounter. However, that is a topic for another time. Among the books of the New Testament, only the Letter of James might classify as Wisdom Literature. Therefore, I will begin there. Early Christian leaders were not certain the Letter of James met the criteria of apostolic writing and some dismissed as either bogus or not essential. The inclusion of the Letter of James in the canon of Christian writings was open to debate during the early days of the Protestant Reformation. The Letter mentions Jesus only twice and speaks to the idea that what we do and say is as important as faith—or so it seems to teach that. Martin Luther called the Book of James the “Straw Epistle.” In Luther’s understanding, salvation comes by faith alone and not by works. James instructs, in seeming contradiction, that faith without works is dead and works without faith is meaningless. However, there is no contradiction in James’ words. Paul and James both agree that true faith is inseparable from works, although they express this in different ways. (Note that for James “faith” means mere belief, whereas the term “works” means obedient action. This is different from Paul, who means by “faith” the act of the will that accepts God’s unconditional promise.) James insists that faith (mere belief) without works is dead, although he does not eliminate or depreciate faith. James does not deny that faith is essential to salvation he simply reminds us that if faith does not change us in what we do and say faith is dead; that is, faith will have no purpose if a change is not evident. James helps us even more when he adds to the thought that faith without works is meaningless when he states that we are to “show our good works are done with gentleness borne of wisdom.” Despite the fact that early church leaders did not fully accept James’ Letter in the canon of Christian Scripture, it would be no stretch of credulity to suggest and accept that the Letter James is the Wisdom Literature of the Christian texts comprising the New Testament. Recall, the Hebrew Bible—the Old Testament—has several books and sections of books that can be classified as Wisdom Literature. Certain Psalms come to mind, the Book of Job probably qualifies as Wisdom Literature, and of course, the Book of Proverbs is the epitome of Wisdom Literature in the Hebrew Scriptures. In the Apocrypha, the Books of the Wisdom of Solomon and the Wisdom of Sirach Ben Jesus contribute to the collection of ancient wisdom texts. The verses in the Book of Proverbs describing the Capable Wife are a beautiful wisdom poem giving strength to the contention of the equality of life shared by women and men. The question, “A capable wife, who can find?” is more than a question answered in the poem about a wife but about the leadership qualities often found in women and ignored, to their detriment, by too many men. I think this question should be restated as, “A capable woman who can find?” Read this poem carefully. One commentator suggests it is a poem written by a mother looking for a capable wife for her son. I prefer another suggestion by another commentator suggests the poem speaks of a capable wife in “military” terms. A capable wife takes charge, gets what she needs for her family, and seems to take the high ground. In one verse of the poem we read, “She girds herself with strength, and makes her arms strong.” Girding one’s self in Scriptural terms, usually refers to the warriors of Israel who are often instructed to “gird up their loins like a man” to make ready for battle or to face the reality before them. No matter how we read and understand words of the Bible, the wisdom of the Scriptures finds its ultimate strength in Jesus. He teaches his followers to avoid seeking status and tells them instead to take up the cross and follow him; that is, seek humble servanthood. Thus, the teaching of Scripture is, selfish ambition, seeking status, denigrating others, and requiring a significant component of the human family to be subservient works against God’s plan and purpose. Regardless whether James’ letter meets the criteria of an apostolic letter or not, the wisdom James projects is the wisdom of Christ Jesus. The Hebrew Bible’s Wisdom Literature ultimately guides us to the sagacious words of Jesus, “Whoever wants to be first must be last of all and servant of all.” Finally, we learn in the words of Jesus that wisdom does not naturally equate to intellect. Not all intellects are wise but those who see the world without jaundiced eyes and with open hearts of love express the wisdom of God, often, more precisely. We are taught by the words of Jesus, “Whoever welcomes one such child in my name welcomes me, and whoever welcomes me welcomes not me but the one who sent me.” This is the wisdom borne of love. Divided into three sections ((1) The Five Books of Moses, Torah; (2) The Prophets, Nevi’im; and (3) The Writings, Kethuvim), the Hebrew Bible, known as the Tanakh—an acronym combining the letters of the three parts—includes the historical books with the prophets and places the Book of Daniel with the Writings. When viewed this way, the Scriptures take on a different slant. The word catholic means universal. The Catholic Letters were written to the Church in general not to a specific church or person as all of Paul’s letters are. The Catholic Letters are the 1st and 2nd Letters of Peter, 1st, 2nd, and 3rd Letters of John, The Letter of James, and the Letter of Jude. Ewald M. Plass, compiler, What Luther Says: An Anthology Three Volumes. (St. Louis MO: Concordia Publishing House, 1959). James 2:17, 20, 24, 26. James 1:3, 6; 2:1; 5:15. Page Hughes, “A Capable Wife,” http://www.pagehughes.com.